There are so many programming languages available to choose from when you start a startup based on digital service or product. Generally, the final call must be made with consultation with the tech team. But once you know the programming languages most of the startups are using, you can make a better choice. There must be reasons why most of the startups are opting for a particular programming language. The following is the list of the programming languages startups are using. 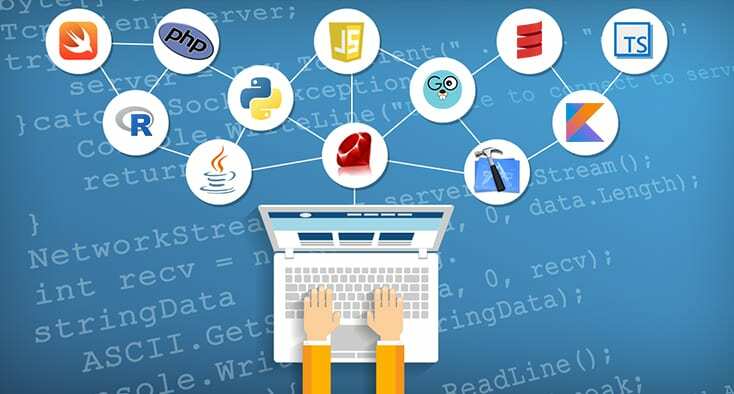 Python – Python is the most preferred programming language among the startups. The reasons are its powerful environment, endless libraries, and scalability. Scalability is one of the most important factors in choosing a programming language for a startup. And there is no better programming language at present than Python in terms of scalability. In Python, the development takes less time and therefore, ideal for startups with a limited budget. It is robust and let you create innovative stuff, and Django framework is a treat to work on. Starting from YouTube, Quora to Instagram and Spotify, all are done with Python as the main programming language. Ruby – The next in the list is Ruby which is one of the popular choices for startups with heavy services and products. The development can be rapid on Ruby with a wide variety of libraries available. There is enough number of quality developers available, and the communities are extremely active and useful. It is suitable for all such developments where active planning and constant changes are a must. Besides, the framework Rails is extremely user-friendly, and it allows both front-end and back-end development in sync. That is why you will find big names like Github, Hulu and Living Social using Ruby for their products and services. However, Node.js development is more fluid than the rest two, and the cost of the developers is lower. If you consider the last year, there are more startups come up that are based on Nodejs than Python or Ruby. As a matter of fact, in a survey, it has been found that most of the successful startups are using either of these three languages. Apart from these, the use of Java and PHP are significantly used. However, most of such startups have changed their technologies after being successful. Scala and Go are on the rise while Perl is becoming extinct. It has been found that the quality companies are more likely to use functional programming languages like Go and Scala. It is needless to say that HTML and CSS are always an essential part of front-end development. However, for the startups, Ruby of Rails is the most preferred programming language for the front-end development. The sole credit goes to Rails web framework. On the other hand, CSS is dominating over CSS3 quite surprising among startups. On the other hand, most of the top startups are still not using Bootstrap. As far as the choice of database goes, MySQL is the leader. All the startups doing okay, they have MySQL as their first preference. The second position goes to MongoDB which is more popular among successful startups. Surprisingly, Cassandra as a database is quite popular among successful startups. Redis is used for caching and Amazon S3 for storage. As far as Big Data software goes, Hadoop is the first preference followed by Hive and Amazon Redshift. As far as advanced tech goes, Big Data is the co-topper along with Machine Learning among startups. Previous post What’s The Difference Between Text File and Binary File?